Various and sundry items of interest to parents and the young at heart. Ludwigsburg Christmas carousel and ferris wheel. If you know you're going to be in the south of Germany in December, there's a not-to-be-missed spectacle at the Weihnachtsmarkt (Christmas market) in Ludwigsburg, a quick S-Bahn ride from Stuttgart. The carousel and ferris wheel are up for a month and run seven days a week during that time. For more information on the carousel and a larger version of the photo below, click here. If you can read German, the carousel owners have a web site of their own. If you're simply interested in carousels, you may want to visit two other web sites, one on US carousels and the other about carousels in Europe (though mostly in England). The ferris wheel, shown in the photo below, can be ridden by adults as well as children. For a larger version of this photo, plus two detail shots, click here. Ludwigsburg Schloßpark. Schloß is usally translated as "castle," though this is more of a palace. The castle itself is probably more of interest to adults and perhaps older children, but the extensive park grounds around the castle are great for the whole family. Ludwigsburg's main carousel is located in this park. It's part of the historical playground and operates daily for several hours. In another area of the park, there's also a very nice contemporary playground. The entire park is a great attraction for children. It has a petting zoo, an outdoor aviary, a maze, several different types of gardens (some are seasonal) and there are fountains and ponds, big and small, as well as a regular (non-historical) playground. There's a separate web site (also in German) all about the miniature train. Click on the first link at the bottom "Zur website," which takes you to their index page and then click on the button "Bilder" at left. This will take you to the photo page, which gives you an idea of what the miniature train is like. Children love it. If you understand German, the history is fun to read and there's technical information about the various locomotives, which may interest some. For the past several years, there has been a pumpkin festival as well. Americans may find it amusing to see something like that in Germany, where pumpkins and Halloween are just coming into their own. The German festival clearly has its own "flavor". Click here for photos. 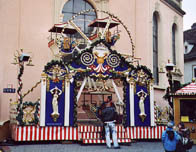 Venetian Festival. 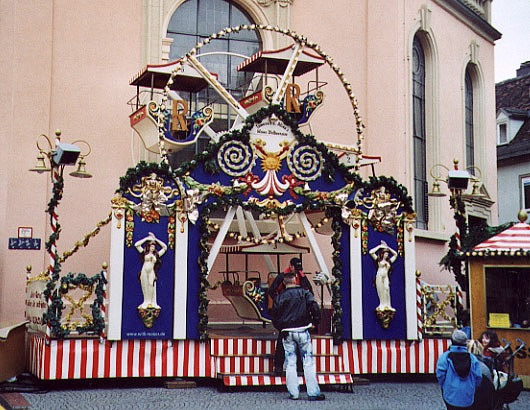 One other Ludwigsburg attraction is the Venetian Festival, which is held every two years in early September. With costumes, dancers, musicans and other performers, this is truly an artist's event, though there's also food and plenty of activities and special programs for children. The people who parade in costume come from various countries in Europe. They make their own costumes, clearly a labor of love. The costumes are imaginative, highly detailed and generally theme-oriented, sometimes involving a couple in matching outfits or as in the photo above, a group. Click here for more photos. Puppets and marionnettes. I don't know the last time I was at a live puppet or marionnette theater, but my son has a several videos produced by Germany's well-known Augsburger Puppenkiste. These videos are so charming, so creative, so well-crafted and the stories so delightful, they've awakened an interest in me in the art form. Madurodam. This is the famous miniature city in the Netherlands, which has been enchanting children for decades. I speak from personal experience here, having visited there myself at the age of nine. I still remember it! It's since grown and been changed, according to their web site, but though it now appears to be a major tourist attraction in Holland, it still looks to be great fun for children. Here are two photos. Swiss Vapeur Parc  Le Bouveret, Switzerland. I haven't been to this park, but came across their web site (in English, French and German). It's another miniature town with replicas of actual Swiss buildings built to scale. There is a also model train here, all set in a beautiful valley with mountains all around. While there's good info about the park and some good photos on their site, you may well prefer looking at some of the photos here, such as this one or this or this one.